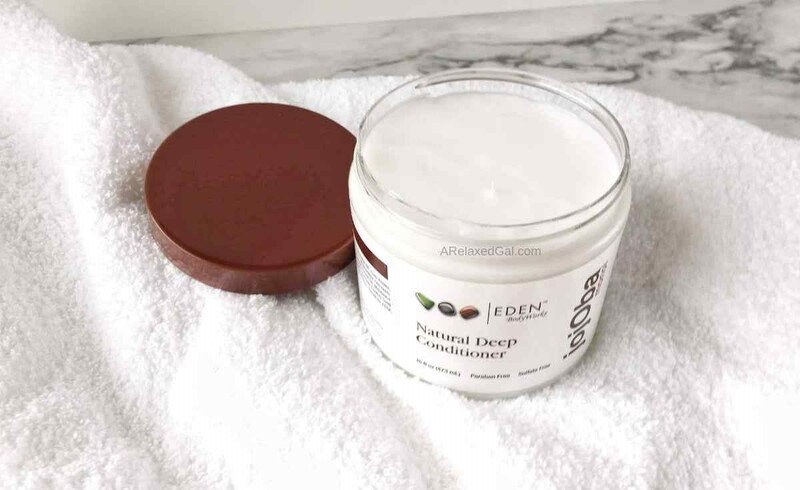 Eden BodyWorks is a brand that I stumbled onto through their Coconut Shea Leave-In Conditioner. I love the leave in and wanted to try some of the other products, particularly in the Jojoba Monoi line since I have had a hard time finding a moisturizing shampoo and deep conditioner my hair likes that lasts more a couple of washes. So I purchased the Jojoba Monoi Shampoo and Jojoba Monoi Deep Conditioner during a B2G1 sale at Sally Beauty. 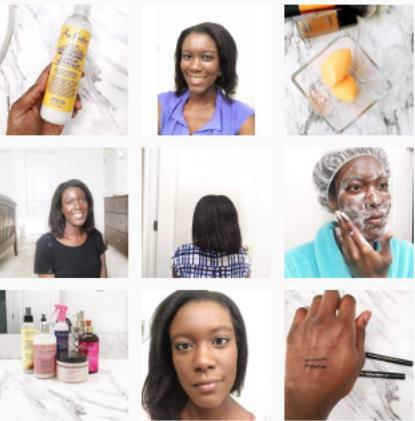 For this review, I am focusing on the deep conditioner. "Water (Aqua), Cetyl Alcohol, Stearyl Alcohol, Stearalkonium Chloride, Coco Nut Oil, Tiare Flower, Glycerin, Behentrimonium Methosulfate, Cetrimonium Chloride, Polyquaternium-11, Simmondsia Chinensis (Jojoba) Seed Oil, Daucus Carota Sativa (Carrot) Seed Oil, Anthemis Nobilis (Camomile) Flower Oil, Melaleuca Alternifolia (Tea Tree) Leaf Oil, Prunus Amygdalus Dulcis (Sweet Almond) Oil, Ricinus Communis (Castor)Seed Oil, Tocopheryl Acetate (Vitamin E), Aloe Barbadensis Leaf Extract, Hydroxyethylcellulose, Disodium EDTA, Phenoxyethanol , Caprylyl Glycol, Sorbic Acid"
The packaging. This is one of the few deep conditioners I have purchased that has a wide opening allowing me to use more than two fingers to get the product out. The first couple of times I used the Eden BodyWorks Jojoba Monoi Deep Conditioner, my hair didn't feel deep conditioned. Not willing to give up on the conditioner, I used it on dry hair for my pre-poo. Boy did I ever notice a difference. My hair felt soft and moisturized. Since I've started air drying I've noticed how much my hair holds onto water and realized that when I used it on wet hair my strands were probably so full of water that the conditioner couldn't penetrate. The conditioner doesn't have a whole lot of slip, but it sinks into my hair better when I use it on dry hair or wring my hair out and towel dry before applying. The consistency of the conditioner isn't as thick as I'd like, but it's not runny which is good for application as you don't get it all over the place and waste it. Eden BodyWorks gives you a lot of product for the price. This makes for a really good pre-poo and I've noticed a positive difference in my moisture levels so I'll definitely purchase again. This has become a staple in my product arsenal. Considering the ingredients and the amount of product you get for the price, it's definitely worth giving a try. 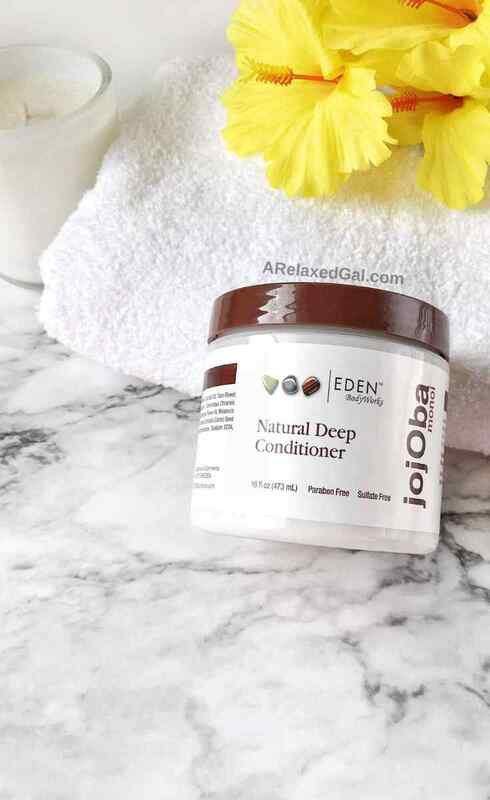 You can purchase the Eden BodyWorks Jojoba Monoi Deep Conditioner using my Amazon or Sally Beauty affiliate links. Thanks for the review, I've been thinking about this product on and off for a while. Thanks for reading. I'm glad I continued using this DC even though my hair wasn't a fan at first. The conditioner doesn't have any proteins in it.